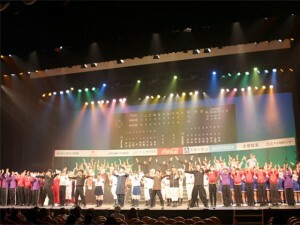 Osaka Broadcasting Arts College and Osaka Animation School held their annual performance of the musical “Koshien Dake ga Koukou Yakyuu Dewa Nai” (High School Baseball isn’t just about the National High School Baseball Championship Koshien Stadium) at the Yonago Convention Centre in Yonago City in Tottori Prefecture on March 24. The schools were invited to stage the musical as the main event for the Future Self-Assistance Project celebrating the 50th anniversary of the Yonago East Rotary Club and the venue was packed with enthusiastic audience members. The purpose of this project was to help the children who will be responsible for the community in the future feel the importance of both working toward a goal and believing in themselves and also to enable them to grow up strong in the future. At the same time, the organizers wanted to give as many people in the local community the chance to see the students giving it their all performing on stage and to give the community an infusion of energy. By chance, Yonago East Rotary Club board members saw a performance of “Koshien Dake ga Koukou Yakyuu Dewa Nai” the year before last and was deeply moved. They wanted the high school students in their community to see the musical and added it to the program for their 50th anniversary celebration. The Rotary Club invited one hundred student performers and production staff to Yonako and paid for all the production staff. The audience was packed with around one thousand people, among them local high school students, parents and guardians, teachers, and local residents. The performance moved them to both tears and laughter, and at the end of the performance the entire audience gave the cast and crew a standing ovation. Osaka Broadcasting Arts College and Osaka Animation School have performed “Koshien Dake ga Koukou Yakyuu Dewa Nai” for the past six year but the performance in Yonago City will be the final show. The two schools plan to take on a new musical this coming fall.